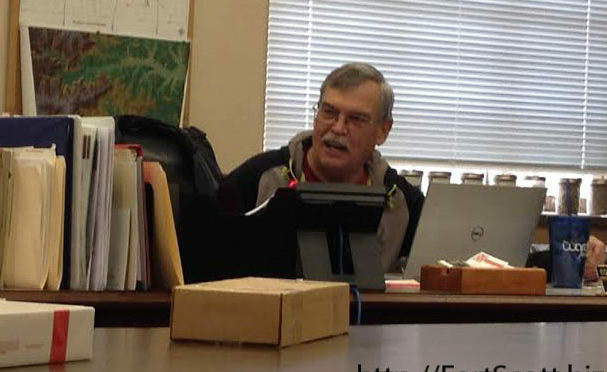 During the Bourbon County Commission meeting Thursday morning, Public Works Director Jim Harris summed up his road and bridge department’s past year as one where they learned to streamline their work in order to save finances. “My goal for 2017 is to continue streamlining it,” Harris said of their department, pointing out that in 2016 they had to learn to complete their work despite losing employees to retirement. With a current hiring freeze and facing two more retirements in March, Harris said they will have to continue to “do more with less,” with both finances and manpower. As a result, Harris said they will have to restructure their labor force in early 2017. Commission Chairperson Barbara Albright said some of those changes can be beneficial to the county. “We’re operating smarter and utilizing our people better,” Harris said, praising his team for their hard work. Because of their limited workers, Harris said they sometimes have to be a little more selective when choosing what work they complete first, but said they continue to keep up with the many tasks needing attention in the county. While the road and bridge fund is meeting their budget carryover for the new year, county funds are still tight for all departments moving forward. In 2017, Harris said he also hopes to see progress made in finding a fourth quarry in the county in the northern region in order to save the cost of transporting gravel to that area. He also pointed out decisions will have to be made concerning asphalt roads. 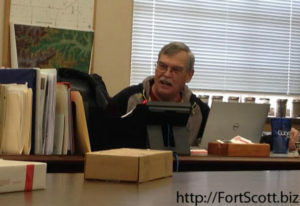 During their final meeting of 2016, held on Tuesday, the Fort Scott City Commission received and approved an Airport Federal Improvement Program for the Fort Scott Municipal Airport as presented by airport manager Kenny Howard. The document includes a five-year capital improvement plan, beginning in 2018, but also looks at some long-range goals reaching all the way through 2027, listing the costs associated with those projects. The plan will be submitted to the Federal Aviation Administration and will be completed based on the federal dollars available, which is provided at a 90/10 percent split, with the city providing 10 percent of the cost. Some of the initial projects include replacing the runway and taxiway edge lighting systems—some of which Howard said have been there since the 1970s, purchasing more land to the south of the current runway and then completing surveys to prepare for extending the runway. Long-term goals include runway and edge lighting extensions, construction of a partial parallel taxiway and the upgrade of other systems. The costs of the projects range from $90,000 to more than $3 million. No projects are planned for 2019 in order to build up funding for future, larger projects that cannot be complete at one time. The city owns 25 acres used for the airport, but would like to eventually buy about 75 more acres. The airport has more than 20 planes, which are used regularly by local businesses and manufacturers, and also houses a new crop-dusting firm that built a hangar. 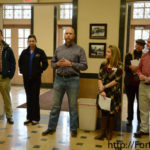 “The airport is kind of out of sight, out of mind, how much business we do out there,” City Manager Dave Martin said, pointing out that its presence and efficiency are key to further development in Fort Scott. The city also gave Police Chief Travis Shelton permission to go out to bid for four new police vehicles. With that purchase, older vehicles will be replaced while two current vehicles will be transferred to the codes department. The commission also approved a four-year lease for 30 new golf carts for the Woodland Hills Golf Course, which will cost almost $19,500 each year. The city will receive more than $14,000 from the company by trading in 16 of the golf course’s current golf carts. The Bourbon County appraiser’s office will be able to complete more work in the field in 2017 after receiving the commission’s approval to invest in a new field software program that will reduce their time entering data in the office. The software made available by Tyler Technologies is used via tablets and allows county employees to enter data while in the field instead of having to return to the office to upload that data, saving the office time. 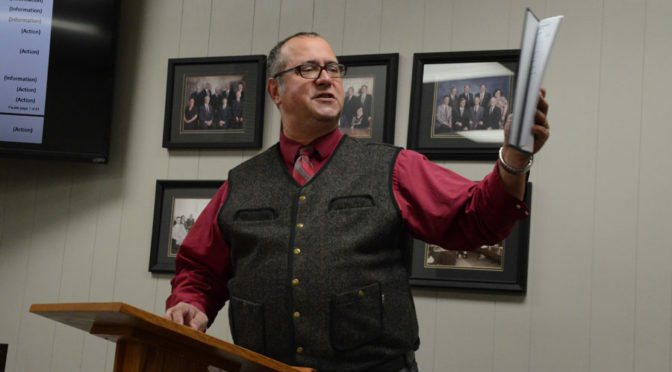 County Appraiser Clint Anderson presented the information to the commissioners Tuesday morning, saying he had been in the process of researching the program for some time. “I think it’s a forward thinking opportunity for us to reduce some costs of our office,” Anderson said. The initial cost of the program is $14,000 for the program itself, its installation and training in it. 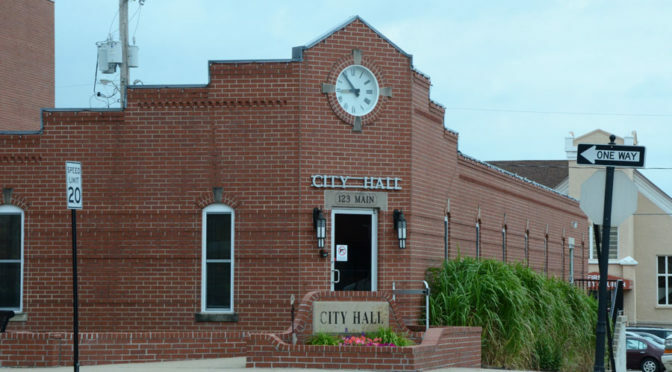 Part of that cost will be taken from the remaining funds in the appraisal office budget, while the remainder will be taken from the Neighborhood Revitalization Program account. Starting in 2018, there will then be an annual, set fee of $3,625, which Anderson said is feasible from his annual budget with the time and money they save by using the program. Commission Chairperson Barbara Albright expressed concern over using a program that is still in just its experimental stages, but Anderson said a number of counties in Kansas are already using it, some of them for at least a couple years. “They’re very happy with it,” Anderson said, saying other counties expressed pleasure with the return on it. Anderson said they already have much of the needed equipment, such as tablets and a laptop the program would be used on. The program is to be installed and the employees trained in it in late March or early April of 2017. The commission approved the program and signed the agreement, with the stipulation that no more than $8,500 be used from the NRP account. County Attorney Justin Meeks also informed the commission that in the near future they will need to consider updating the policy handbook, since it has had few updates since the 1990s. On Tuesday, the commission decided to go ahead and make the change of allowing residents outside of Bourbon County to be hired for county positions that require specific licensing, such as attorneys and nurses. The application of such a policy will be put in place after the commissioners approve the handbook as a whole. Other issues to be addressed could involve employee training and orientation, nepotism, compensation and the relationship between the county policies and those held by the sheriff’s office. 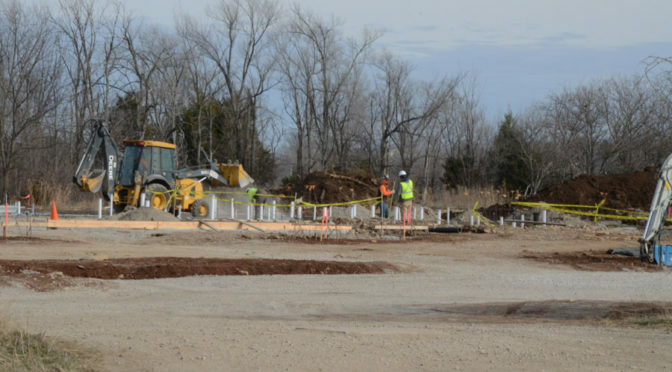 The Bourbon County Commission received an update on the Law Enforcement Center Thursday morning, learning that the project continues to move forward despite winter weather and rough terrain. 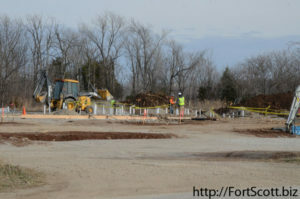 “There’s a lot of underground going on right now,” Gary Walker of Universal Construction Company said, saying they are currently working on the deep underground features such as water, sewer, fiber and electricity. Because of the rock underground, Walker said they had to raise the pad about a foot to try to avoid jack-hammering through as much rock, while in other places they had to dig further to find the rock since the goal is to have the concrete foundation resting on it. Walker said they have been pushing the project in order to get the concrete laid before it got too cold to do so. While the construction team can work on the metal building in cold weather, the concrete has to have the correct temperatures to set. “Winter came early,” Walker said, but added they still plan to pour concrete Wednesday, though that schedule also depends on how difficult it is to drive through the remaining underground rock. “You have no control,” commission chairperson Barbara Albright said of the weather and terrain. The metal building of the jail is supposed to be delivered by the end of this week while the cell pods are to be fabricated by the end of the month and delivered by the end of January. After that, the stairs that are also being constructed off-site will be delivered and installed. Walker said they will meet with the architects soon to make sure they have met their expectations so far, saying that is part of their quality control to make sure they get it done right the first time. Walker also addressed the finances so far, saying the buyout of the project is nearly complete and the construction contingency is still completely intact. “It’s been a fun adventure so far,” Walker said of the project. Commissioner Lynne Oharah, who frequently attends project meetings and visits the site, said they are currently close to their target goal and it is still on schedule to be completed by the end of 2017. In 2011, Bourbon County joined Allen and Neosha counties to become a part of the Kansas State Research and Extension Southwind District, which has provided information and services on a number of topics to residents since that time. “We are here to serve you guys,” local district agent Christopher Petty said during a Chamber Coffee Thursday. Petty pointed out Kansas State University is a land grant institution, meaning it was created using federal funds, and now has offices in each county so it can serve residents around the state. Before the Southwind District was formed, the three counties held separate offices that were funded by county commission general fund budgets, but in 2010 it instead became its own tax entity. District Director Carla Nemecek of Iola said joining into one district allowed the agents to specialize in specific fields instead of merely providing general information on several topics. The agents now focus on fields such as horticulture, health and wellness, food and nutrition, health insurance, agriculture, and 4-H programs for youth. Throughout the year, the district provides informational programs on a variety of topics from a number of speakers. Other programs include the Walk Kansas health initiative encouraging exercise and the Stay Strong, Stay Healthy class held at the Buck Run Community Center for older members of the community. 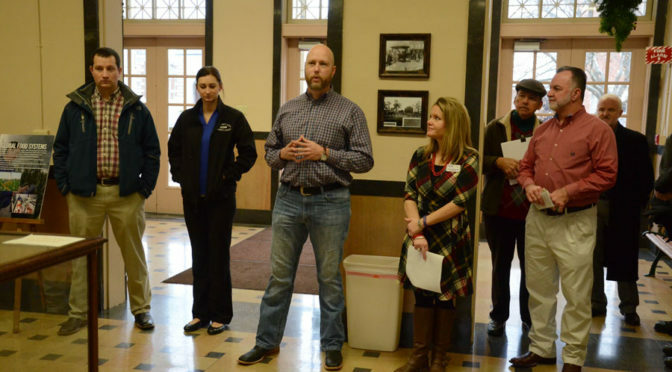 “We’ve been grateful and humbled by folks receiving us into your communities,” Nemecek said, adding they enjoy meeting and serving people in the three counties. 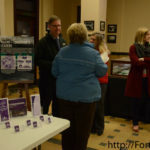 Most of the services provided are offered for free, although there could be small fees if samples have to be sent to Kansas State. The extension agents answer to a locally elected board of officers. 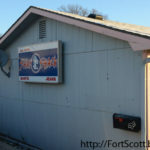 The Southwind District has offices in Erie, Iola and Fort Scott. 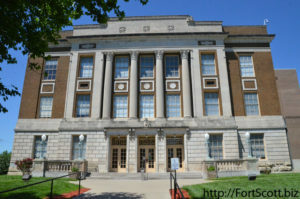 The Fort Scott office is located on the first floor of the Bourbon County courthouse. 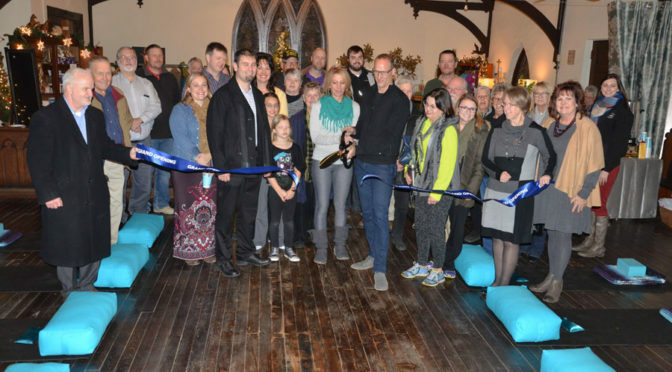 After a November soft opening, the Shiney Studios held their grand opening Wednesday evening at their location in the historic, downtown building that formerly housed St. Andrew’s Episcopal Church. More than two years ago, Fort Scott resident and commercial quarter horse breeder Dandelyon Vredenburg had a massive stroke that resulted in her right side being paralyzed. 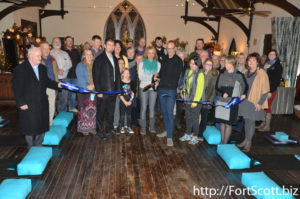 But through a recovery process that included yoga and meditation, Vredenburg recovered completely and is now a co-owner and instructor at the new yoga studio. That period of her life marked a change that led Vredenburg to begin writing in an online journal and through a Facebook page that eventually reached more than 600,000 followers. With that newfound passion, Vredenburg began to turn her attention away from horses and to her writing and the idea of a yoga studio. 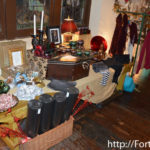 Inspired by the name of a horse, Twice as Shiney, which she had recently sold to a new owner in Brazil, Vredenburg and co-owner Carl Repp opened the Shiney Studio in the old Episcopal Church, using the location for yoga classes as well as for retail, selling items such as lotions, jewelry, candles and clothing. 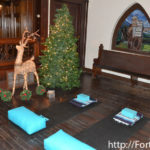 The studio offers a variety of yoga levels, from beginning to more advanced. The students can also request private or group sessions. Future renovations of the building include turning rooms into a wellness center and even living suites. 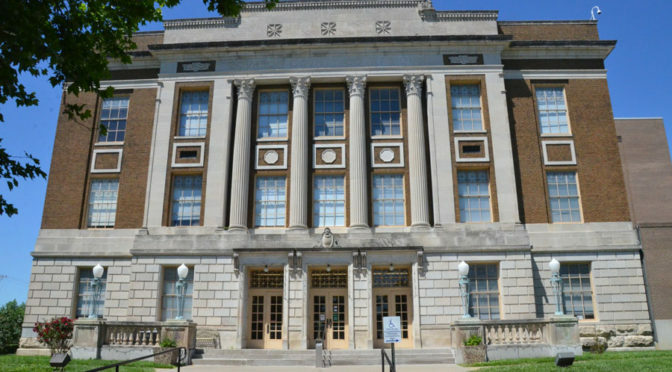 Vredenburg and Repp said they look forward to preserving the historic building, even providing printed information about the structure and the artifacts that remain inside it. 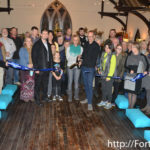 Repp said they hope the building will become a destination for others interested in participating in classes held in the previous church. 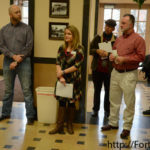 “We’re just excited about all your plans,” said chamber of commerce executive director Lindsay Madison, while City Manager Dave Martin said he is glad the downtown building is again in use and being used to further the arts in Fort Scott. 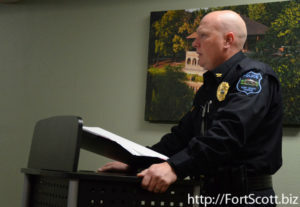 After much discussion and research by the Fort Scott City Commission and police chief Travis Shelton, the commission voted unanimously Monday evening to allow Utility Task Vehicle’s on city streets. 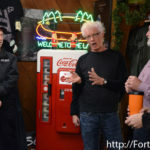 During past meetings, local UTV owners spoke in support of allowing those vehicles on city streets, pointing out that golf carts had been allowed on streets with no issue. UTVs are usually larger, heavier and more capable of higher speeds than golf carts. The commission had asked Shelton to create an ordinance that would specify what UTVs would need in order to be considered street legal. 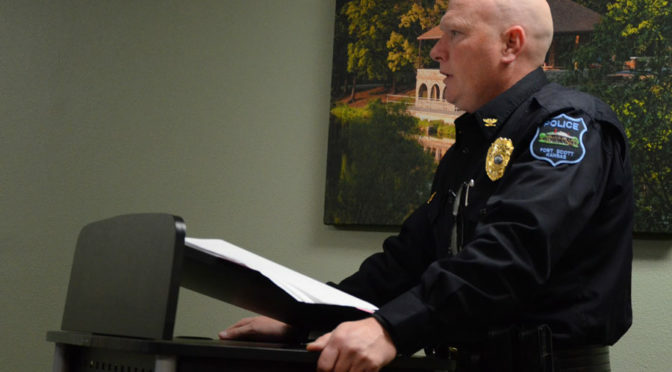 Shelton presented that ordinance during their meeting Monday evening, which will now come into effect January 1. Though capable of high speeds, the ordinance demands that UTVs not drive on certain streets or at speeds higher than 35 mph. They will also be required to have at least two side or rear-view mirrors, turning signals, reflectors, a muffler and seat belts. Some of those features do not come with a purchased UTV, but can be bought separately as a kit. UTV owners will be required to register their vehicle with the police department and have their title registered at the county courthouse. Those without a title will not be allowed to register or legally drive on the roads. Another issue previously raised involved the UTV tires, which often use softer materials than most cars use. But after consulting with owners and researching the issue, Shelton said they decided not to require UTV drivers to purchase separate tires since there is not enough data to show the tires would do any harm to the roadways or affect the drivers’ safety. The commissioners gave their approval while asking Shelton to bring a report back after six months to see if there are many violations, accidents or road problems as a result. 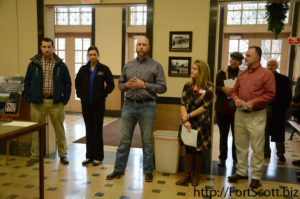 The commission approved working with the Healthy Bourbon County Action Team to create a strategy on how to improve health in Fort Scott and the county. A $43,000 bid for the repainting and resurfacing of the aquatic center was accepted. Funds from the Buck Run Community Center reserve will be used to replace their current surveillance system, which is about 15 years old. Fines for not keeping property up to code for will now be a minimum of $300 instead of the previous $50, which will include the city mowing the yard and clearing branches if needed, and also covers administrative fees. Homeowners in violation of the property maintenance ordinance will now be given six months to complete the needed improvements before their structure is condemned. During their meeting Monday evening, the Unified School District 234 Board of Education received a positive audit report to help wind up the end of the year. Terry Sercer, certified public accountant for Diehl Banwart Bolton, said his job was to look at the school’s report of all their cash, balances and receipts for the entire year and make any adjustments that might be needed in order to hold to state and federal statutes. Sercer said very few adjustments had to be made to the district’s report and said the unencumbered cash remained almost the same from the beginning of the year until the end, aside from the bond money which continues to decrease as the project progresses. 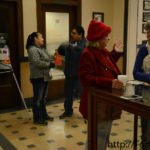 “You have good cash balances in your funds,” Sercer said. Sercer pointed out that there were no violations of Kansas or federal statutes and that their school activity funds were also in order. 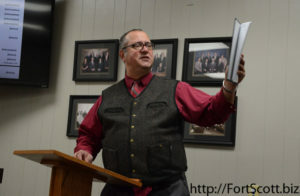 “Really a good audit report for you this year,” Sercer said, adding he always enjoys helping Fort Scott’s school district because of his own family ties to the schools. 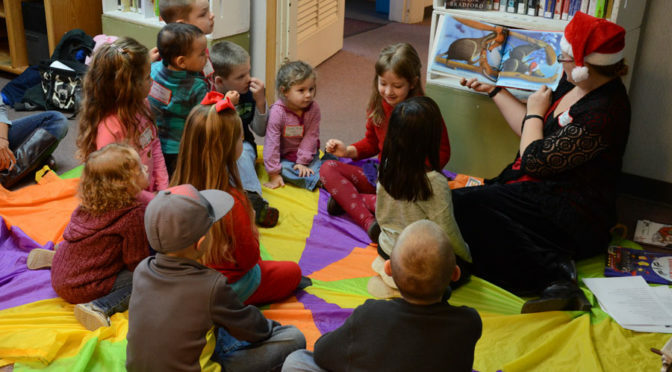 Fort Scott Public Library will host its Second Annual Holiday Party on December 19, in the temporary library location in the Memorial Hall basement. 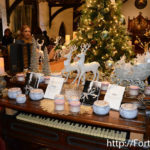 Holiday stories and songs will start off the party, which opens its registration table at 3:45 p.m. and runs from 4-5 pm. 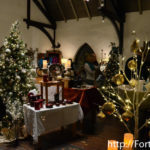 Activities, prizes, snacks and crafts will also be offered for various age levels, and families will stay together as they move through the various activities. Children and teens of all ages are encouraged to attend, and all children 2nd grade and under will need to be accompanied by an adult at all times. The library is looking for volunteers and donors from the community to help make the event a success. Pre-registration is available by joining the Facebook event, emailing vcyouthlib@gmail.com, calling the library at 223-2882, or filling out the registration sheet at the library. In 2015, the party brought in around 50 attendees, who enjoyed the variety of activities and commented favorably on the overall event. 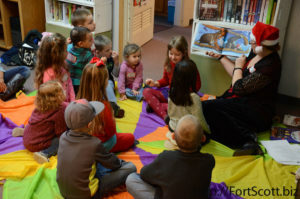 Librarian Valetta Cannon hopes this year will be just as successful, and will also bring new patrons in to see what the library has to offer, both in materials available for borrowing and youth programming. 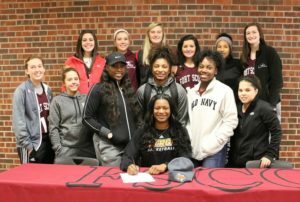 Fort Scott Community College sophomore Natalia Ready has signed a national letter of intent to further her education and basketball career at the University of Texas – Rio Grande Valley. Ready, from Little Rock, Ark., averages 11 points, 5.5 rebounds, and 4.2 assists per game. 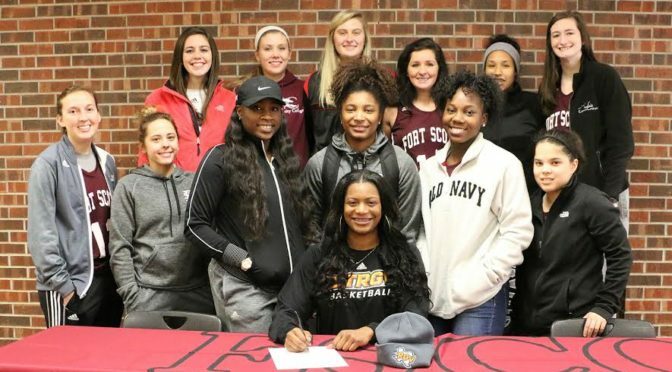 FSCC Women’s Basketball Team had its best season start in the history of the program, with 11 straight wins before being handed their first loss Saturday, their final game prior to the Christmas break. 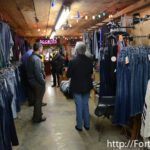 For 40 years, Billy Webster and his Shirt Shack have provided shirts, jeans and other clothing options to the city of Fort Scott, with some of those options being the closest ones available apart from a drive to Kansas City. “I’m just lucky, I guess,” Webster said of being able to stay open such a length of time. Webster, a Fort Scott native, first began screen-printing t-shirts in a 10×12 square foot building when he was just 18 years old when the trade was still new and rare. 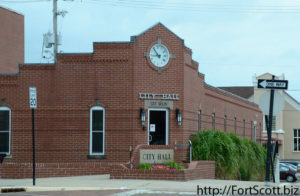 Since that beginning in 1976, Webster has added on to the building a number of times while also adding to the business. 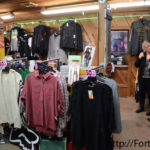 While the Shirt Shack still provides screen-printing for shirts, Webster said he no longer travels with them such as for concert tours like he once did, saying he prefers to spend more time in Fort Scott. 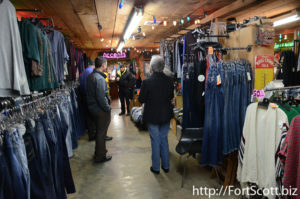 The business also does embroidery and cleaning and sells other clothes items such as a variety of jeans styles. 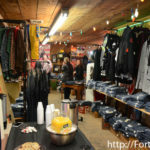 Lindsay Madison, executive director of the Fort Scott Area Chamber of Commerce, pointed out that Webster and his business also invests in the city of Fort Scott by providing shirts for events and organizations such as Care to Share. “He does contribute a lot to the community,” Madison said. 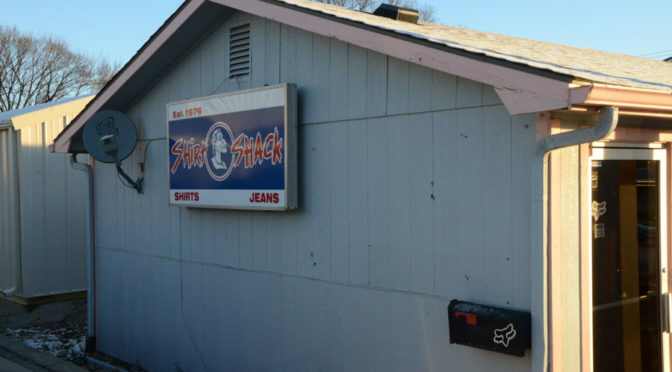 The Shirt Shack can be found near the intersection of 18th Street and Highway 69.